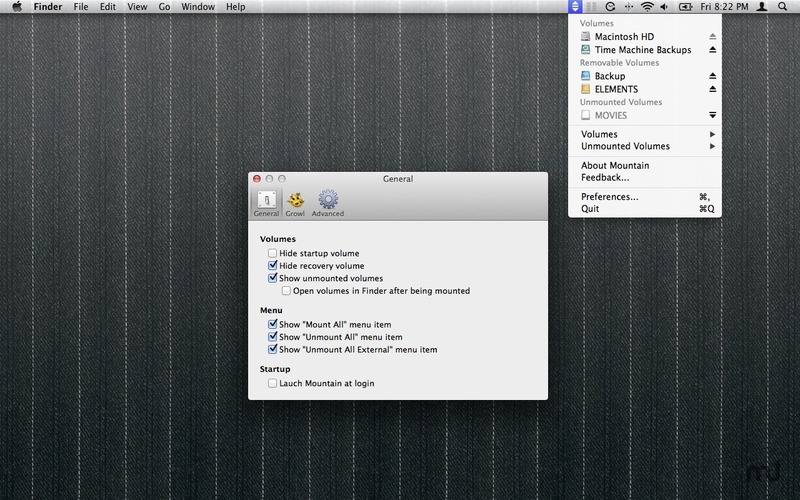 Mountain allows you to manage volumes with ease. It allows you to mount, unmount, or eject volumes with only two clicks. Unmount a single volumes or eject all external volumes at once. Unmounted volumes will be spun down and can either be unplugged or reactivated in Mountain without the need to unplug the USB cable and plug it back in. Automatically unmount external volumes when the system goes to sleep and remount them on wake up. Remount recent network shares with a single click or remount them automatically on boot up or wake from sleep. Prevent external volumes from being mounted upon connection. Prevent volumes from being ejected. Identify applications that block volumes from being ejected and quit them right away. Get notified whenever a volume becomes available or an external device can be unplugged safely. A click on the notification will open the volume in Finder. The Mountain menu bar icon will indicate if external volumes are connected or if you are clear to unplug all device cables including network connections. Speed up ejecting and mounting of all external volumes at once using global hotkeys.